200 years ago King William I gave the order to build a royal barge. 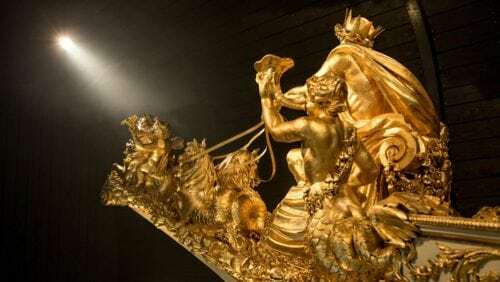 In this time, richly decorated rowing boats were a ‘must have’ for European monarchs. As a maritime nation, a royal barge was definitely also a must have for the Dutch. The ‘Royal Chaloup’ was built between 1816 and 1818 at the Navy Yard in Rotterdam. After the closure of the shipyard in 1851 the sloop came to Amsterdam. It eventually took 23 years before the king officially used the boat for the first time. Meanwhile, the Royal Barge has been used about 30 times for state visits and other official occasions, most recently in 1962 by Queen Juliana and Prince Bernhard during their silver wedding anniversary. Between 2014 and 2015, the Royal Barge has undergone a thorough restoration and will now be permanently exhibited in the new boathouse across from The National Maritime Museum. From an early stage Rapenburg Plaza was involved in how to exhibit the presentation and background info of the boat and has previously supplied and installed AV equipment. A large monitor wall with video content from Arjen Klerkx seems to bring the sloop completely to life. With the lighting design Rapenburg Plaza ensures that every detail of the boat comes into its own.